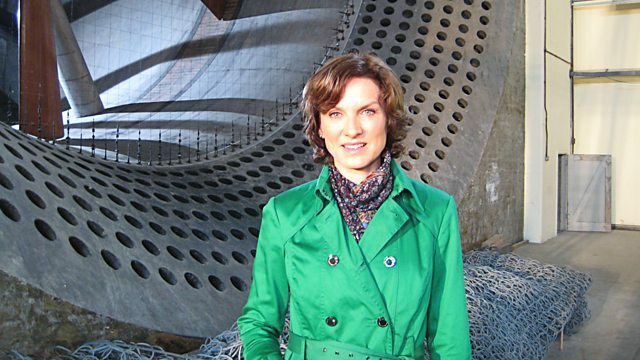 Fiona Bruce and the experts return to the exciting backdrop of the Farnborough wind tunnels for another busy day of evaluations. Items include a mammoth's tooth. Fiona Bruce and the experts return to the exciting backdrop of the Farnborough wind tunnels for another busy day of evaluations. There is a diverse collection of objects brought before the cameras, including a mammoth's tooth dug up in a garden, the Monopoly board game used by the Great Train Robbers whilst in hiding, including real cash from the heist, lavish gifts given by Hollywood stars to a favourite film cameraman, plus a family photo album which proves worth cashing in for a new kitchen. Unfortunately the BBC Red Button play along will not be available for this episode.